For optimal cosmetic and medical outcome, ablation (EVLA, RFA, MOCA) can be complemented with microphlebectomy. This is a technique in which very superficial bulging veins are removed using tiny punctures. 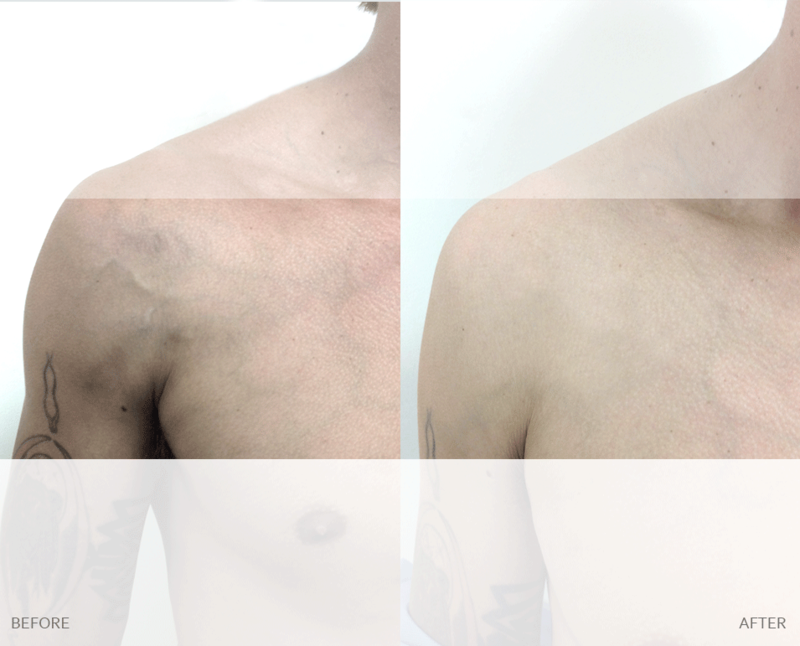 Initially, these bulging veins are marked with a marking pen while the patient is in a standing position to help identify the veins once the procedure begins. Local anesthetics will be used to numb the area. Then a real-time ultrasound or translumination system Veinlite will be utilized to precisely identify the vein location. A 1-2 mm puncture incision is made on the skin at each of the problem veins, and they are removed. Microphlebectomy is most often performed in addition to EVLA or Mechano-chemical ablation, and therefore the recovery is very similar, with essentially no major restriction or discomfort. Patients are able to resume daily activities immediately. Sclerotherapy involves the injection of a medication, or sclerosant, into the diseased vein. The tissues of the vein will be damaged by the sclerosant, and will completely disappear after some time. Sclerotherapy is for the cosmetic removal of spider veins, or reticular veins, and it can be added to ablation for the removal of larger veins. Before any cosmetic injection, our experts will perform a comprehensive physical and ultrasound examination in order to rule out a possible underlying circulatory problem that may require a different approach in order to maximize results in the long-term. After careful assessment, a sclerosant (medication) agent will be selected. The medication will be converted into a solution form (straight or foam), and a dose will be decided based on the size, type and location of the vein. We only use extremely safe and medically approved agents at our clinic. Next, a tiny needle – the smallest available for medical use – will be used to deliver sclerosant into the vein under visual guidance through a system called Veinlite. The injections are essentially painless and the process takes 20-40 minutes depending of the size of the treated area. The patient’s extremity will next be dressed in a stocking or multilayer compression dressing for 48-72 hours. The patient may require a course of 3-4 injection sessions to the same areas for optimal results. Once the injections are complete compression stockings must be worn for two weeks. After the procedure there are no restrictions and any activities can be resumed. Patient usually return to clinic in 10-14 days for reassessment and to continue sclerothrapy. Chest Veins	Overall rating:	5	out of 5 based on 17	reviews.